Courtney Marie Andrews is an American singer/songwriter originally from Phoenix, Arizona. After several releases and tours she made her way up to Seattle, Washington, where she currently lives. She will be releasing her fifth album, “On My Page” on April 23rd, produced by Ryan Hadlock (The Lumineers, Ra Ra Riot, Blonde Redhead) at Bear Creek Studios in Woodinville, Washington. In the Spring and Summer of 2013 she will be touring through the U.S. and Europe in support of “On My Page”. 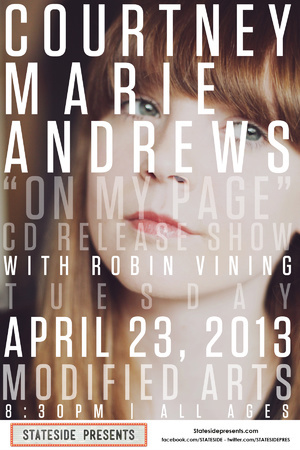 For the release of the album, Ms. Andrews is returning to her original home, where she hosted her first album release shows. Tickets are $8 in advance at Stinkweeds record shop, and $10 at the door. Robin Vining of Sweetbleeders and many others will open the show. Find official event details here.